Sunda flying fox silhouettes against the sunset. Photo by: Tiffany Roufs. Rain or clear, wind or still, full moon or no. 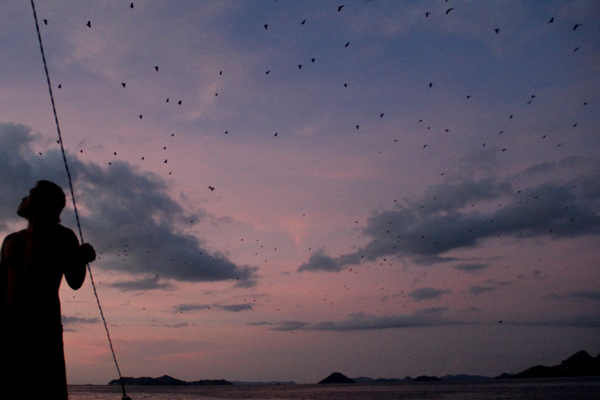 Every night thousands of flying foxes rise from a small mangrove island among the lesser Sunda islands of Indonesia. Around sunset the Sunda flying fox (Acerodon mackloti) begin to stir in their roots—their stomachs waking them—until the boldest among them takes off into the sky. 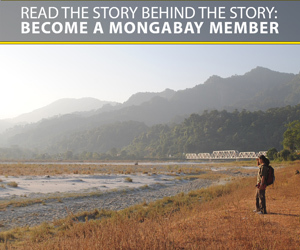 Thousands follow, making the short journey to nearby Flores, home to the famous discovery of Homo floresiensis. 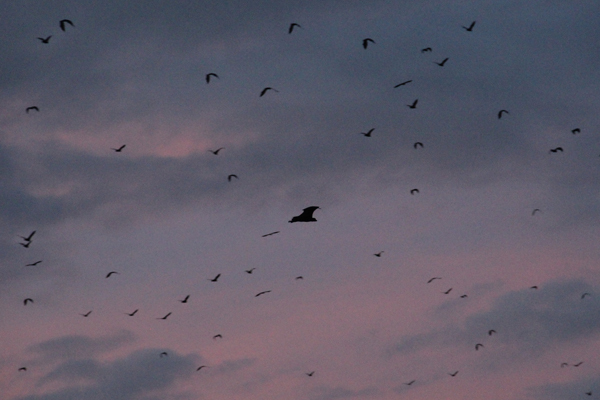 Early in the evening the boldest bats fly from their mangrove roosts first. Photo by: Tiffany Roufs. 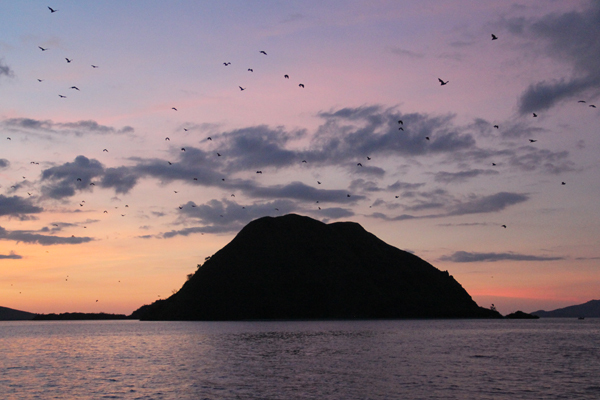 On Flores, the giant flying mammals spend the night feasting on fruits. 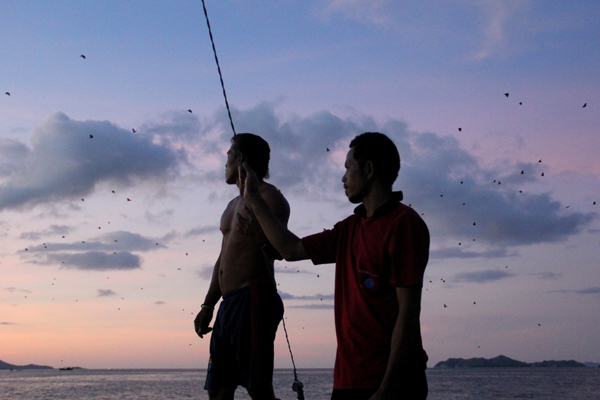 At dawn they escape back to their mangrove roosts, flying once again across a small marine strait to reach their island home of Pulau Koaba or, in English, fruit-bat island. 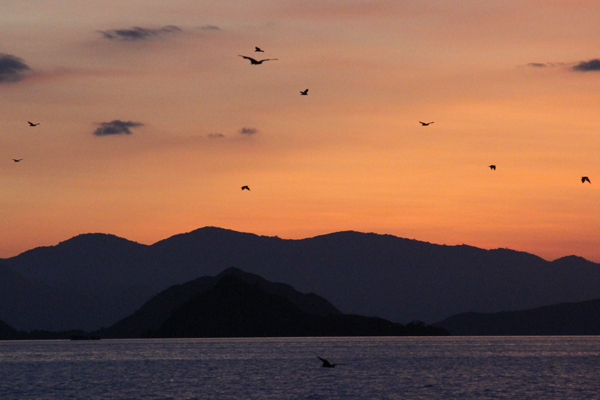 This tiny plot of land rising from the sea lies just off of Rinca Island, home to the infamous Komodo dragon. Bats and Pulau Koaba. Photo by: Tiffany Roufs. 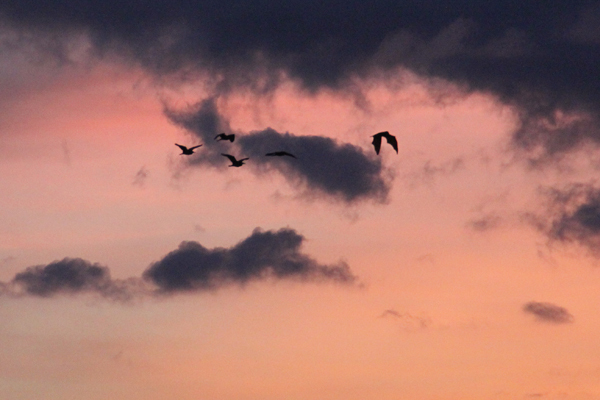 The flying fox prove deft in the air, swooping and diving, some even skimming the sea. 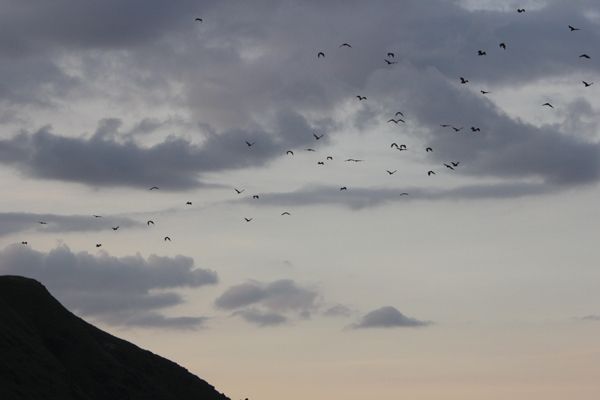 It takes over an hour for the whole flock to fly over. As populations of many species continue to decline worldwide and as wildlife migrations&#8212whether annual or daily&#8212are interrupted by infrastructure, climate change, and development, sites of animal-abundance, such as this, have become increasingly rare. Local men watch the flying fox show. Photo by: Tiffany Roufs. Sunda flying fox are imperiled by hunting and habitat destruction, especially large-scale logging in the region. Their range is naturally restricted as the species is only found in a small area of islands including Lombok, Sumbawa, Alor, Sumba, Moyo, Timor, as well as Flores. 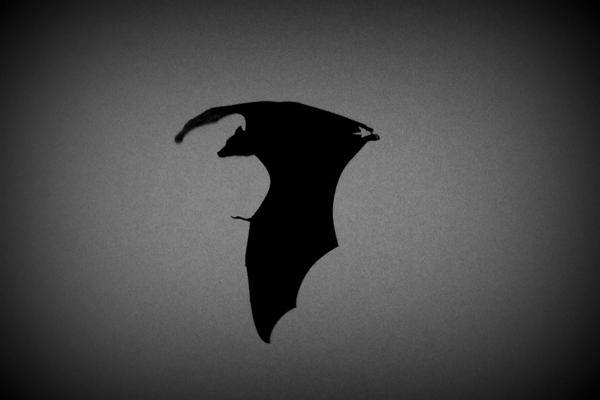 Silhouette of a Sunda flying fox. Photo by: Tiffany Roufs. Fruit bats, of which the biggest are often called flying foxes, play a huge role in tropical forests as both pollinators and seed dispersers. Their ability to scatter seeds far-and-wide is especially important. But recent research has found that flying fox dispersal ability is severely hampered when populations drop, meaning that successful seed dispersal depends on large aggregations of foxes—like that of Pulau Koaba. The flock of bats include individuals who stay close to sea, even skimming the water. Photo by: Tiffany Roufs. The flight of these thousands-strong flying foxes is also an undeniably powerful tourism draw, for an area that sports both Komodo dragons and some of the world’s best diving and snorkeling spots. 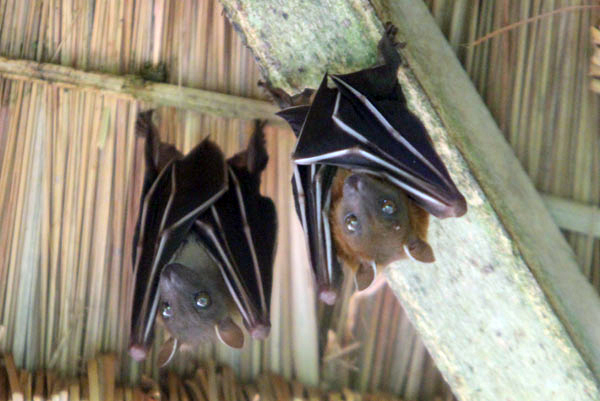 There are nearly 200 species of fruit bat on the planet, all found in the Old World, i.e. Africa, Asia, Europe, and Australia. Most fruit bats are incapable of echolocation. An unidentified species of fruit bat caught waking up in Sumatra. Photo by: Tiffany Roufs. Sunda flying fox crossing the sea. Photo by: Tiffany Roufs. 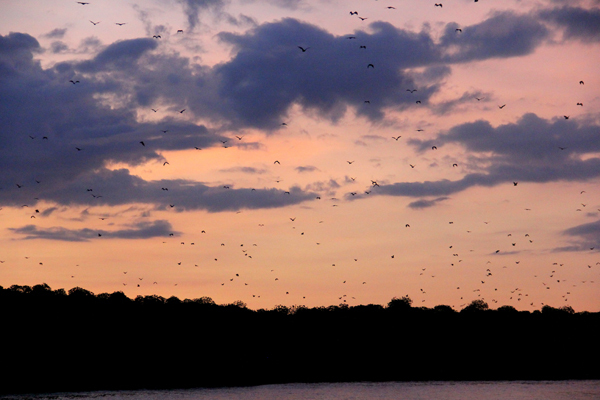 A seemingly uncountable number of bats taking off from the mangroves. Photo by: Tiffany Roufs. Watching the twice daily spectacle. Photo by: Tiffany Roufs.